Flash in Street photography is a very useful tool. It produces a harsh light that has a more gritty feel which fits a certain style of street photography. Mark Cohen and Bruce Gilden are two great example of street photographers who have made great use of flash. But getting into using flash in street photography can be tricky to work out how to use it correctly. That’s the problem I came across with the Flash on my Fuji x100t. There was a built-in flash but I didn’t know how I should start using it. So I made this guide to help other Fuji x100t users who want to use the flash on the Fuji x100t. I’m sure there will be useful points for other photographers out there who use different cameras. New to flash street photography? 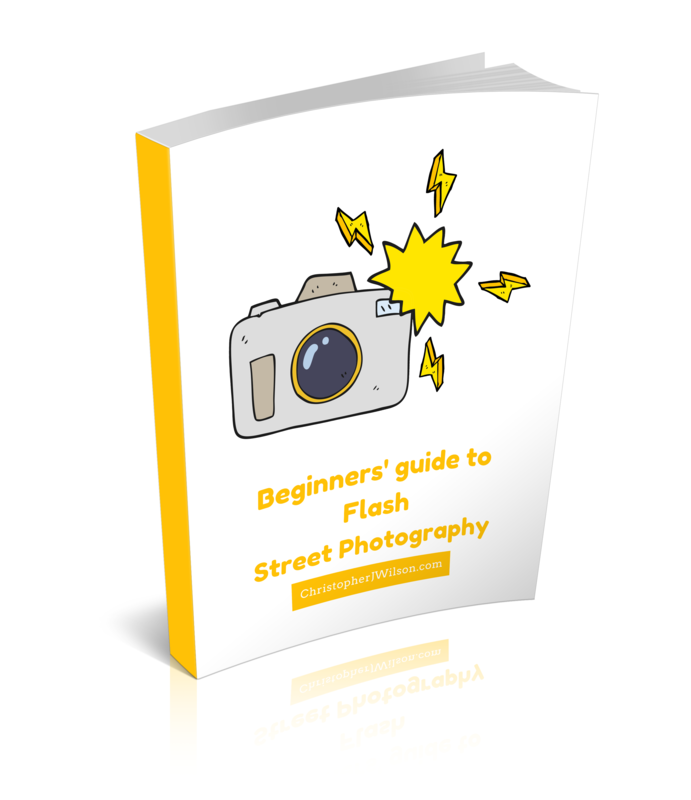 Sign up with the street photography academy for free and get this flash street photography guide for free too! Plus many more great resources. Why use flash on the Fuji x100t? Dirty Harry “aka Charalampos Kydonakis” has said that he uses flash because it is “the only way for him to control the light on the streets“. I think this is probably the best short summary of why you should consider using flash. This ability to control the light means there are lots of different aspects and effects that you can create. There are more personal reasons for using flash but these are probably some of the core reasons. Personally, the second two details appeal to me the most. I want to be able to capture details no matter what time of day. I also quite like the style that flash causes in images but I don’t always like it. Still, it is something I’m experimenting with more. These are all valid reasons for not using flash but I would suggest you consider trying flash anyway. Flash does give a very different style and can capture photos you can’t get in other ways. You never know what you may discover when you try and experiment using flash. set up on a stand and triggered remotely. These will create slightly different effects and open up other options. Using off-camera flashes allow you to control the direction of the light in a way you can’t with on-camera flash. However, that is a topic for another article. The rest of this post is going to be based on the built-in camera flash. Specifically, the built-in flash on the Fuji x100t. A couple of practical ideas you might want to consider as you begin experimenting with flash. It can be very intimidating to start shooting using flash on strangers at night. Attracting a lot of attention and at the same time, not even taking a good photo. So instead, I suggest two ideas. By starting with friends at night, you can work out what is working or not. How bright the flash will be and how obvious you are going to be. Then by using it in daylight, you get used to using flash and being noticed when you shoot. Yet you are also slightly more discrete than shooting at night. I’ve changed my menu options so that my top function key activates and deactivates my flash (switching from forced flash to suppressed flash). You can change flash mode by going into the menu (press the menu button). Then scroll to menu 5 and find the flash options there. If you get to this menu and you can’t activate your flash, then it is probably because your camera is in silent mode. Silent mode stops your shutter making a noise (obviously), however, it also has a side effect. It stops you using the flash. If you want it to be silent and not distract anyone, then you don’t want a bright flash, do you? So make sure that you haven’t got silent mode on if you want to use the flash. (You can still disable the shutter sounds by turning them off. This setting is located in the sound menu). Most modern flashes (especially built-in flashes) offer TTL metering. That means the flash takes the data from your camera’s metering system (be that spot, centre weighted or evaluative) and your focus distance, then sets the flash based on that information. This is very useful during the daytime and for making street portraits. It helps you to focus on composition and just take the picture. However, if the scene is moving fast, you can miss shots or “decisive moments” by the camera’s brain taking a bit to long to think through the shot. However, with the Fuji x100t, if you start setting your camera manually, you are going to assist your camera’s flash brain. For example. By setting your camera to a fixed ISO (maybe ISO 400), aperture (f11) and zone focus. You are now telling your camera what exposure it needs at the right distance (based of ISO, aperture and distance). If you take note of the distance of your zone focus, you will be able to freeze your subject, correctly exposed at the right distance. If your subject is closer to the camera, it will be overexposed, if it is further away, it will be underexposed. This means it’s up to you to get into the right position/distance, to capture your image (or edit in post). Shutter speed will not affect your flash’s exposure as the light travels too quickly for it to factor in. Instead, your shutter speed controls the “ambient exposure” and will affect the surroundings of your image. That means if you have a longer shutter speed, your background will be brighter and, most likely, more blurry due to the movement of the lens. Unlike natural light photos or shooting in a studio. Out on the streets, you have your flash exposure and your ambient exposure. The ambient exposure is what you would see without using the flash. If you didn’t have the flash on, it would take that image. You can, therefore, work out how the surroundings will look by setting your shutter speed accordingly. It will only affect your ambient exposure, while the other settings (ISO, aperture, flash strength) will also affect your flash exposure. This means that during night time you can have a frozen subject up close while the background lights and people swirl. A cool effect that can be overdone. The Fuji x100t also has built-in exposure compensation, it’s nested a little deep within the settings but it will allow you to adjust your flash settings so if you really wanted, you could have your zone focus and flash exposure position different from each other. A final feature of note is the slow synchro flash setting. This allows you to fire the flash after the shutter opens. letting in light before firing the flash. This is great for creating a trail with a frozen subject at the end rather than a frozen person and the hint of a ghost moving away from them as you would with a normal flash setting. Here are some fun ideas just to get you started with using manual flash on the Fujifilm x100t. These are just something to start with but definitely adjust the settings as you play around. You may prefer a slightly different style. Of course, you can use an external flash, these open up some extra options and have different controls. I’m yet to play with one [update: I now have a Fuji EF-X20 and here are some ideas] however I am considering the EF-X20 to add a few extra options to my shooting. Do you have any tips for using flash on the Fuji x100t?